A division of Maverick Industries, Inc. When I first saw a note about the Secur Sun Power Bank 4000, my curiosity piqued. 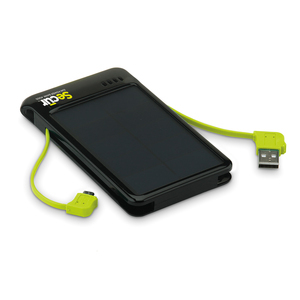 “A solar-powered charger for my various gadgetry,” I queried to myself. Could it really be? Well, I had to find out for myself and report to you on my findings. The Secur Sun Power Bank 4000 (4000) is approximately the same size and weight as an Android phone. The dimensions make it easy to carry or to stow away in a small bag. You can plug into the charger using your mini USB connector or you can use the built-in one. It’s a matter of convenience and space as to which one you use. For Apple device users, you have to carry along a charger cable to plug into the device’s standard USB port. Remember to press the On/Off button on the bottom of the unit or your device won’t charge. To charge the unit fully, you plug it into a computer’s USB port via the built-in standard USB cable. Alternatively, you can place the unit in direct sunlight to charge it via its high-efficiency solar panel. As intriguing as it sounds to have a solar-powered battery charger, it’s not all that practical when recharging the charging unit itself. You’ll probably plug it into your computer for a full charge, which requires four (4) hours. The reason that using the sun isn’t practical for recharging the unit is that it requires 14 to 18 hours of full and direct sunlight to a full charge. I suppose that you could leave it on the dashboard of your car while you’re at work or in school and hope for a half charge when you’re ready use it. That minor flaw aside, if you’re in a real power pinch and you’re also in the sun, you can use the 4000 to power your phone while you make an emergency call. As a charger, the 4000 is cool. As a solar-powered charger, it’s about average. Solar cells haven’t really made the efficiency leap that’s required for today’s power-guzzling gadgets. Maybe in a few years the battery charging technology and the battery-sucking technology will meet in a better place. The lack of solar cell efficiency isn’t the fault of the manufacturer; it’s just a technological shortfall. It will get better (more efficient) and less expensive to use solar. Why it’s frugal: For an estimated $70, the 4000 isn’t all that frugal unless you live in a place that gets a lot of sunlight or you do as I suggested and leave it on the dash of your car to power up. As a standard portable charger the 4000 is fine, but a little pricey. It’s frugality is mostly based on your access to the sun for recharging and your need for “off the grid” power. I once owned a “solar” calculator that I loved. It lasted for more than 15 years. In fact, I might still have it somewhere in the garage. Solar-powered devices rarely die. The advantage my calculator had was that it really wasn’t bound to the sun for power. That would have been downright silly–that the only place I could use it was outside when I really needed it inside. Thank goodness it was photon-powered and not just solar-powered. If you don’t know the difference, this isn’t the place to learn it, sorry. 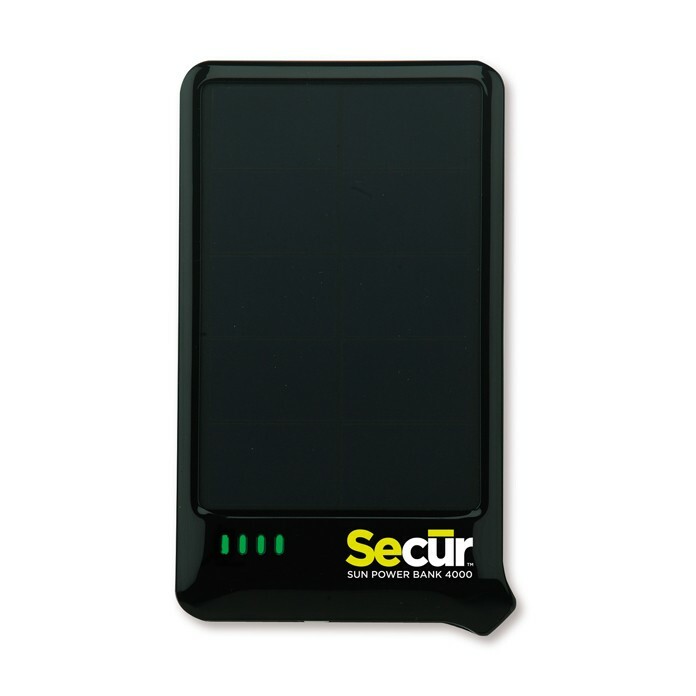 The bottom line here for the Secur Sun Power Bank 4000 is that it’s a clever device. It’s well-designed. If you’re a camper, hunter, beach-goer, or truster of things left visibly in the sun, then the 4000 is a jackpot for you–you can totally survive with your gadgetry in an off-the-grid fashion. For some people that’s really important. If you ignore the whole solar thing, unless you really need it, the 4000 is still a good portable source of power. It’s lightweight, clever built-in cord design, and cell phone sizing makes it a nice companion for you on-the-go types. Recommendation: This is your chance to go “green” and to spend some time in the sun.